I’d like to share a couple of anecdotes with you. I went to a barber’s shop this week and waited my turn. The guy in the barber’s chair already had short hair. Impatiently, I thought, that will take five or ten minutes at most. I waited and waited, busying myself with paperwork while overhearing the conversation between the barber and his client. I finished shuffling papers and began watching. I settled into observing the barber’s immaculate scissor work, how he cut each hair or group of hairs with great precision and concentration, as if that moment in time was all that mattered. I thought to myself, what if I (or we) put that amount of loving care into nurturing the Earth? What a difference that would make when practiced daily! That same week I was sitting in a dentist’s chair in my hygienist’s tiny office. 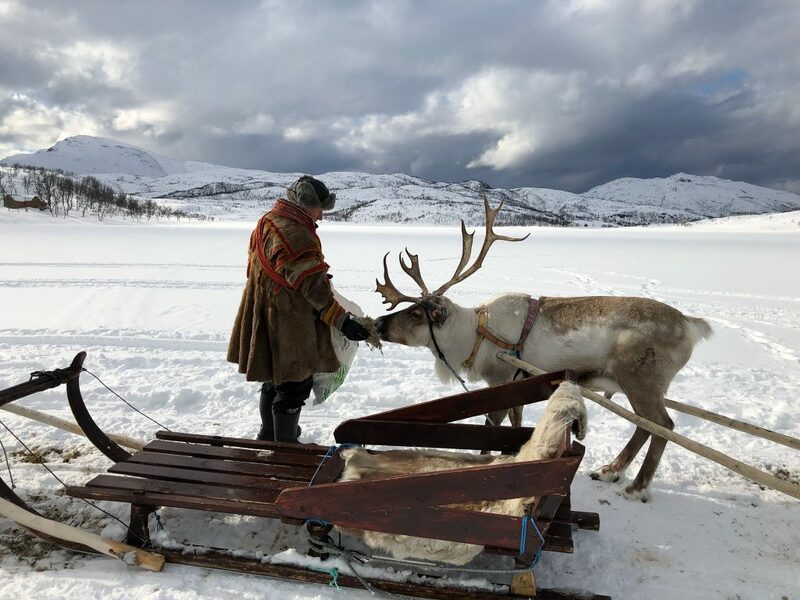 On the wall was a new picture, the photo of a Sami herder that Sarah Pondolfino had taken on her phone while on holiday traveling up and down some of Norway’s fjords. Her other vacations in recent years were spent in Cambodia, Vietnam, Guatemala, and Northern India volunteering for Global Dental Relief to work with children and their communities. This reminded me that I am both fascinated and in awe that indigenous peoples on every continent experience the same reality. In Western terms, I summarize it as: they see everything as alive and imbued with spirit; they turn to spirit in all matters great and small for guidance including planting, harvesting, rain, new technologies etc. ; they are bound in community to each other and to the web of all life forms, and giving to those communities is as necessary as breathing. Indigenous peoples have such a deep sense of guardianship and protection of Mother Earth and the land that it can be very difficult for non-indigenous folks, like myself, to truly understand. Likewise, it seems to me, that we Westerners have never understood the depths of their spirituality and ways of life, which are inseparably intertwined. How amazing! Without their connection and guardianship of the land, we would surely be done for! At times, I do experience strong feelings of helplessness, sadness, and anger in relation to what we’re doing to Earth. I also find that there are many beacons of hope both outer and inner. It seems to me a question of which way I turn or am turned, as we all are key to life’s unfolding. the eyes, or in the dust of collapse. before that first melting bite. into the light of a new day.